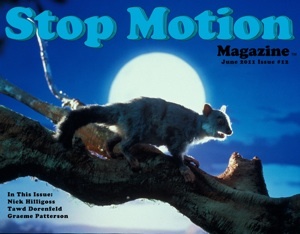 Stop Motion Magazine: Issue#12 and the Cancelation of Twisted Clay!!! Issue#12 and the Cancelation of Twisted Clay!!! The New Stop Motion Magazine Issue #11 June 2011 is now officially available for Free Download at www.stopmotionmagazine.com. I know, your saying "Hey, it's August! Where's Augusts Issue?!?!". Well, since everyone is on vacation that helps with the Magazine, plus being on the crew of a stop motion television show for the summer, the magazine is way behind. But, I'm pushing through with getting the issues out. Hopefully my crew will come back soon, LOL. So I hope you enjoy this issue which marks the 2 year anniversary of the magazine. WooHoo!!! 2 Years!!! Twisted Clay Film Festival is Officially Canceled! Also, this may be the last year for the Stop Motion Magazine Film Festival due to the overwhelming flood of Stop Mo Festivals that have popped up all over the world. When we started the first festival there was only the G.I. Joe Festival that we knew about. Over the past year I've seen a handful of festivals that are taking free entries. Which is great!!! But since the magazine is located in Los Angeles and the price of renting theaters is high out here I am forced to think about the time, effort, and necessity of such an event. We will however run this years Stop Motion Magazine Film Festival 2011!!! The location is still up in the air. HI John, looking forward to the new issue. Sounds great rolling the Twists into the main festival. Makes good sense. If the web gets a little faster, someone could hold a satisfying online festival. Screen films, live video chat, etc. Coolness without leaving the house.